Time constraints can limit an animal’s potential to survive in a given habitat and the maximum size of its group. Many studies have, therefore, investigated the ecological correlates of time allocated to travelling, foraging and vigilance. However, animals spend more time inactive than active, and understanding the determinants of this resting time may provide new insights into the habitat-specific time-budgeting problems that animals face. We analysed the environmental constraints that determine the minimum amount of daytime an average primate has to spend resting, using data from a wide range of ecologically different species. However, total resting time consists of two components: enforced resting time (imposed on the animal by ecological constraints) and free resting time (the time available for allocation to ecologically functional activities). We show that the ecologically important enforced resting time is determined by diet and annual temperature as well as by temperature variation. Our tests of the biological significance of this relationship show that enforced resting time distinguishes between locations that are suitable or unsuitable for particular genera. We show that an annual temperature increase of 2–4 °C would greatly increase enforced resting time, leading to serious time-budgeting problems for many species. The effect of changes to enforced resting time on the biogeographical distribution of species is especially strong for folivorous primates. This study shows that resting time is an important component of animal behaviour that can help us understand extinction risk and geographical distribution of taxa. 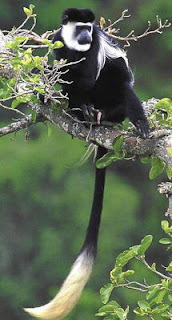 Read more about this paper on PhysOrg.com, African leaf-eating monkeys are ‘likely to be wiped out’ by climate change.